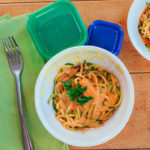 Zucchini “noodles” are a great lower carb substitute for pasta and you can easily make them with a vegetable peeler, mandolin, or a spiralizer, if you’re really fancy. The pasta-like texture is a perfect base for all sorts of sauces and toppings and they don’t get soggy like pasta does, so they’re great for any meal prep. Once cooked, they’ll stay al dente until you’re ready to eat them. Our decadent-tasting sauce gets a luscious, creaminess from goat cheese and lick-the-bowl-clean flavor from roasted red peppers. You can make this dish even faster with jarred roasted red peppers, or make it extra special by roasting your own peppers. 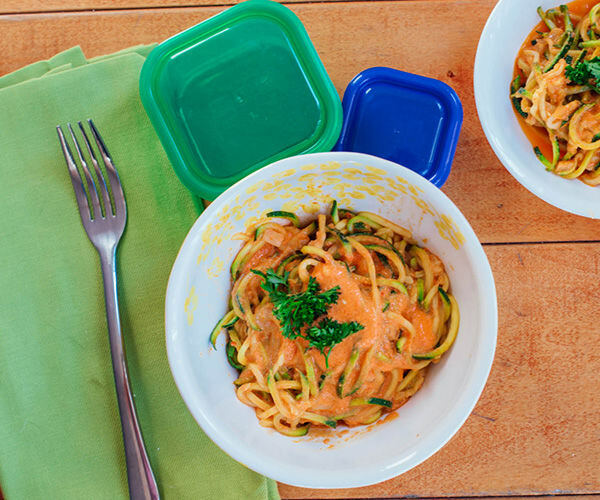 This zucchini "noodle" dish gets a luscious, creaminess from goat cheese and lick-the-bowl-clean flavor from roasted red peppers. Combine 1 tsp. oil, roasted peppers, and cheese; mix well. Set aside. Heat remaining 2 tsp. oil in medium saucepan over medium-high heat. Add onion; cook, stirring frequently, for 3 to 4 minutes, or until onion is translucent. Using a vegetable peeler, cut each zucchini into lengthwise strips about ⅛-inch thick. Turn zucchini slightly after cutting each strip to work evenly around the outside, stopping when you hit the seeds at the core. Discard cores. Cut slices lengthwise into ½-inch ribbons. Add zucchini to onion mixture; cook over medium-high heat, stirring frequently, for 2 to 3 minutes, or until zucchini softens, but before it releases liquid. Add salt and roasted pepper mixture; cook, stirring frequently, for 2 to 3 minutes, or until heated through. Divide evenly between two serving plates. Garnish with parsley (if desired); serve immediately. A delicious veggie and fats accessory as part of any meal or snacktional.